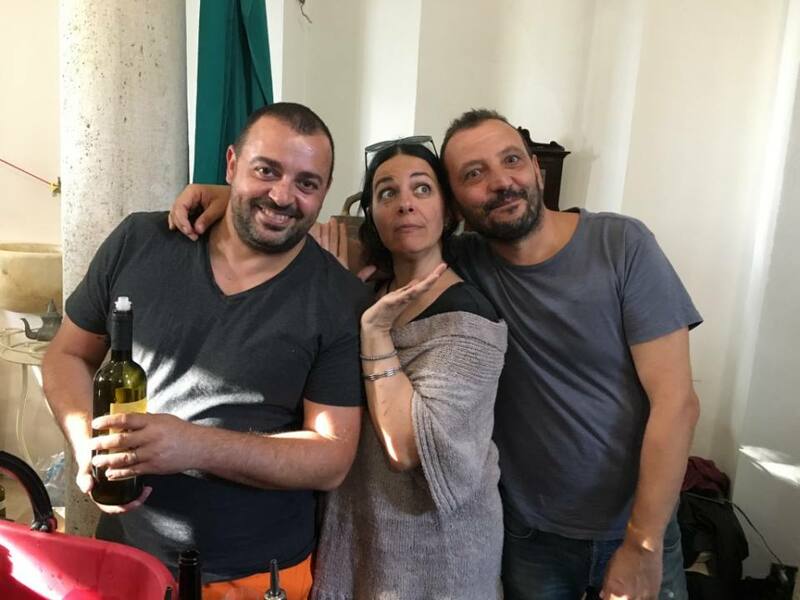 Francesco Di Franco and his wife, Laura moved to the coastal city of Cirò to make top quality, “natural” wine with Gaglioppo, the most important native variety of Calabria. 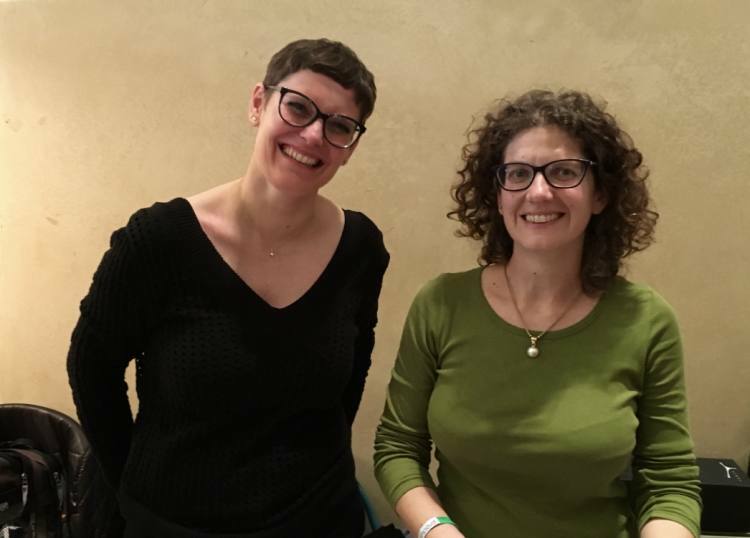 The scope of their project is as much cultural as oenological: to showcase the natural beauty, history and artistic tradition of a largely forgotten and unknown part of Italy on the “toe of the boot”. Cirò (pronounced cheer-oh) could be called the Mississippi of Italy. It is about seven hours driving south of Roma and largely in the grip of the ‘Ndrangheta, a crime organization considered tougher than the Sicilian Mafia. The wine of Calabria (90% Cirò DOC) is mostly produced with industrial methods whether in small or large wineries. Francesco, grew up in Cirò. Like many Calabrians looking for better opportunity, he went north to university. There he met Laura, a native of the northern region of Friuli Venezia Giulia. 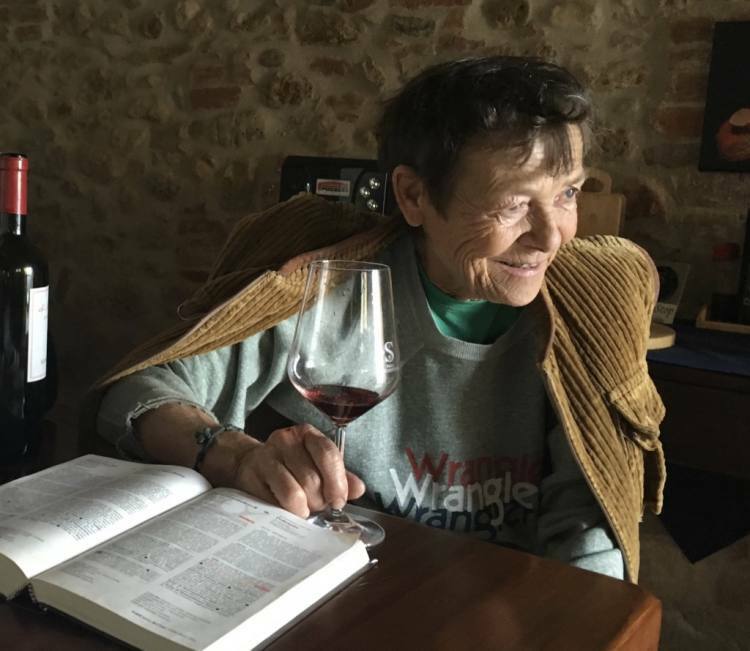 The more he learned about oenology and quality, “natural” winemaking, the more he wanted to go home and demonstrate the full potential of his home. Laura left friends and family to go with him. Francesco bought four vineyards: a combination of fifty year old alberello vines and vines planted in 2003 using massal selection. One of the vineyards is near the sea in Cirò Marina (the port of Cirò), and the rest are in the hills near Cirò itself. The views from the medieval borgo are stunning. The winding streets, piazza and buildings are as charming as those of any Tuscan hill town, but Cirò has largely been abandoned. Empty houses and villas, like this one, have “Vendesi” (For Sale) signs plastered on them. Instead of focusing on the difficulties, Francesco and Laura saw opportunity. 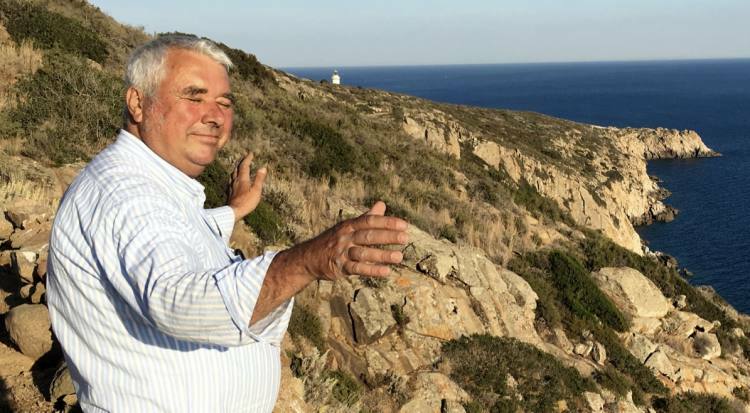 Francesco told me that in ancient times the Greek city of Sibari, just north of Cirò, was considered the most fertile and fortunate place in all of Magna Grecia. Situated on a plain between two rivers, there was plenty of water for crops, fruits and vines to grow in abundance. “Vivere a Sibari” (Living in Sibari) is still an Italian expression meaning “living in the lap of luxury”. In the late afternoon of the first day of my visit, Francesco took me up to his north facing vineyard. I had arrived from that direction, driving down the spine of the Apennines through two vast National Parks, Pollino (700 square miles) and Sila (285 square miles). The road to the vineyard is a country lane. Nearing sunset, the place was bathed in late afternoon silence. And passing down the long rows with fatherly attention. He farms organically (certified organic), leaving his vines to grow naturally without pruning their tops and allowing flowers and herbs to grow among the vines. He uses only sovescio, no animal manure or chemical fertilizers. The old alberello vines have to be tended by hand. Their softly curving trunks reveal the movement of sap over years and years. Their roots penetrate into the calcareous clay soil, picking up minerals that lend a salty crispness to the wine. There are also large changes from day to nighttime temperature that add complexity and depth. The old vines are tucked among clusters of olive trees, fig trees and macchia mediterranean, the bushes and herbs that grow wild around the Mediterranean. This kind of biodiversity makes the soil and the vines healthier. At the end of our vineyard visit, we stopped to pick figs. The next morning, Francesco took me out to his vineyard by the sea. 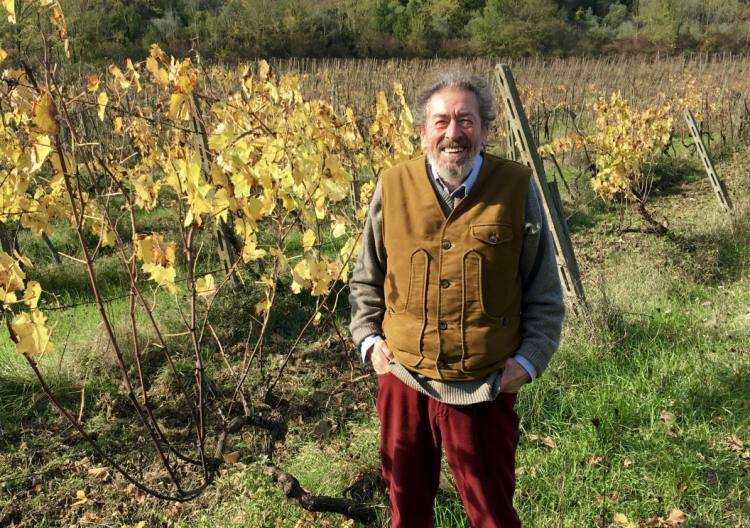 By 8:00, the sun was beating down as Francesco walked down one of the long rows of vines. The sea breezes mitigate the summer heat and add a hint of salinity to the wine. 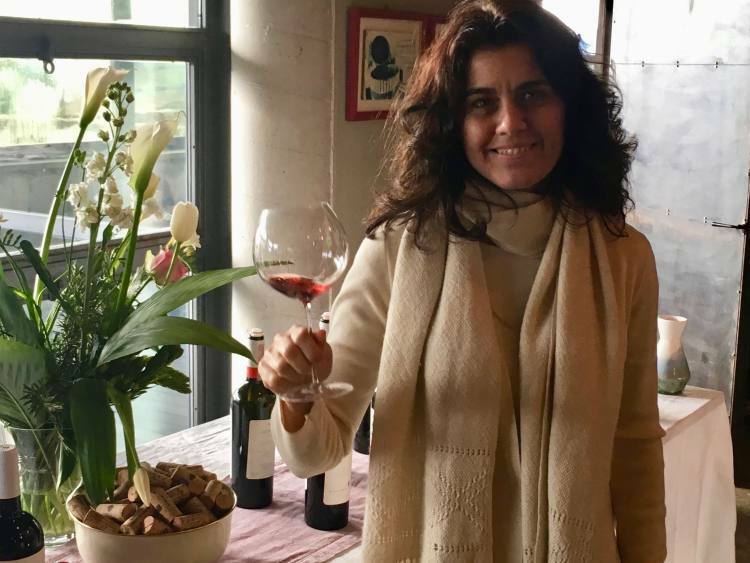 Francesco’s Gaglioppo wines are strong (14-14.5% alcohol) but elegant: an intriguing mix of delicacy (minerality from the soil and the sea) and power (“tannins without compromise” in the words of Francesco). They have the austerity of a Barolo but sing a different tune, something warm and southern, a product of light, sea and sun. Amazing. We started with the rosé. On the day I was leaving, I went into the cellar and found Laura just beginning an afternoon of bottle labeling. She and Francesco work as a team with Laura doing the administration, planning, labeling and events. The cellar has its own piano and posters from arts and music gatherings she had planned. As a couple, they encourage other artisan winegrowers. During my visit, Francesco accompanied me on visits to four other winegrowers, all of whom are colleagues more than competitors. They are vastly outnumbered by big, industrial companies that largely rule the DOC. In 2011, Francesco and his friends tried to hold onto the rule that Cirò be 100% Gallioppo, but a change was made allowed 20% international varieties to be added. Throwing in some Merlot tones down the tannins for international palates but compromises the essence of the denomination. 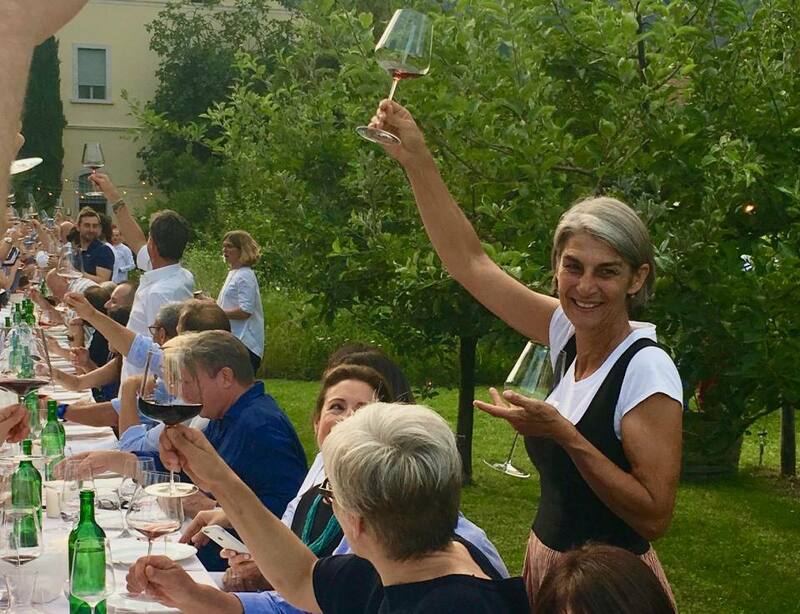 As Francesco said, “It’s a shame because adding other varieties changes the personality of the wine.” As in many other regions in Italy, the DOC classification system, which was designed to establish quality standards, represents majority commercial interests instead. No matter. Francesco and Laura are making the real thing. After a few days in Cirò Marina, I found myself fantasizing about finding people to come and buy abandoned houses in the village. The astounding beauty of the place and the quiet, persistent enthusiasm made me want to stay. I liked Francesco’s and Laura’s story, keep making the wonderful wine.